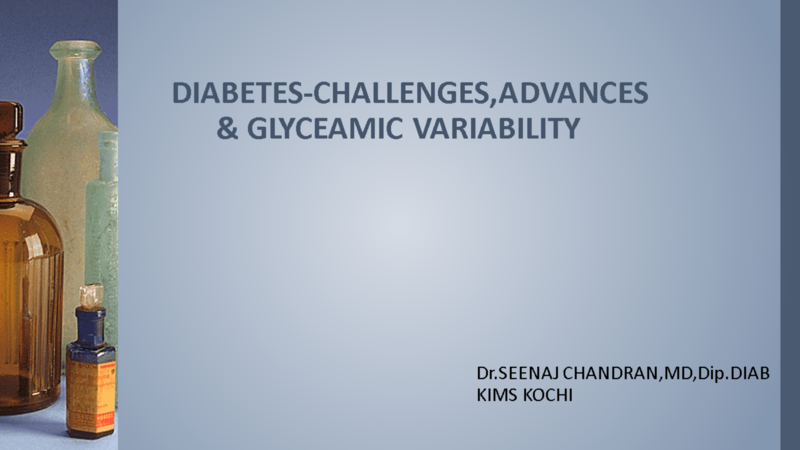 View DIABETES CHALLENGES,ADVANCES& GLYCEAMIC VARIABILITY.pptx and other presentations by gsquaresolutions. Key messagesMarked PPG excursions and glucose fluctuations that occur despite HbA1c levels <7.0%. Fluctuations are not sufficiently reflected by changes in HbA1c.Thus relying mainly on HbA1c at a target level of 7.0% may be inadequate for timely therapeutic adjustments and reducing the risk of cardiovascular complications. Key learning'sThe same HbA1c may, in a portion of patients, generate different and unpredictable diurnal patterns with glucose fluctuations of different magnitude.May be suggested that a decreased amount of glycemic excursions without any improvement in HbA1c may result in an improved outcome by reducing oxidative stress and the risk of complications.Conventional measures of glycemic control in conjunction with intermittent glucose measurements not sufficient to optimize glycemic control. Short CGM periods under primary care conditions provide measures that have the potential of improving glycemic control. Such measures include the MAGE or other indices of glycemic instability, mean CGM sensor glucose range, and the time spent out of the euglycemic range. Continuous Glucose MonitorSubcutaneous sensor attached to unit worn on belt.Typically worn for 3 days.Measures BG continually.Download graph of BG.Elucidates potentially unknown BG excursions. N Engl J Med. May 24 2007;356(21):2176-2183. 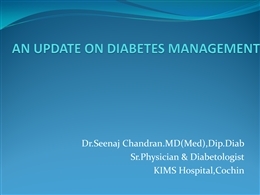 Case no 142 y/o female,school teacher mother of two with hx of GDM 6 years ago, term 3.2 male infantHas not been seen for follow-up in 3 yearsFBS done at annual check up 149Does this patient have type 2 diabetes? What next? 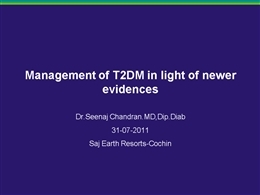 Diagnosis of diabetes generally requires 2 abnormal valuesPatient is at high risk for developing type 2 diabetesGDM is a pre-diabetes conditionRepeat FBS 3 days later……. Repeat FBS 135Dx: Type 2 diabetes - FBS >126 on 2 separate occasions- Could have done an A1C as wellWhat should be done next for this patient? 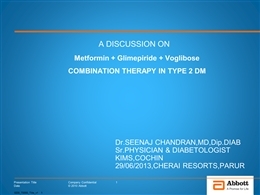 Case no 387 y/o lady resident of a oldage homeType 2 Diabetes for 20 yearsPMH: HTN, dyslipidemia, mild dementia, hypothyroidism, CVA, CHF Stage 3 CKD (GFR 37, Creatinine 1.0)Current meds:Metformin 500 mg BIDDaonil 5 mg BIDLisinopril 10mg dailyFurosemide 20 mg dailyASA 81 mg dailySimivistatin 20mg dailyLipids adequately treatedBP 142/86A1C 9.0What is appropriate for this patient? Metformin, sulfonylurea NOT good choices >80 y/o, or declining renal functionMetformin NOT good choice with CHF risk or historyBP abnormal- high risk of recurrent CVA Lipids- Evidence show benefit of treating to age 85, case by caseA1C = 8.0 appropriate for this age group -less risk of hypoglycemia vs. lower A1C (demented poor at reporting symptoms) -better alertness than higher A1C BP: Increase Lisinopril to 20mg, monitor creatinine and K+Lipids: Continue present DM: ?